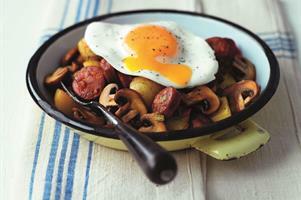 This delicious hash is fired up with fresh chilli for a bit of spicy heat. It’s finished off with a fried egg and chopped parsley for a simple brunch, lunch or supper dish – and it’s ideal for a bonfire night option without the eggs. Cook the potatoes in lightly salted boiling water for 15-20 minutes, until tender. Meanwhile, heat the olive oil in a large frying pan, then add the chorizo sausage, onions and chilli. Cook over a medium-high heat for 2-3 minutes. Add the chestnut mushrooms and cook for a further 3-4 minutes, until the mushrooms are browned. Drain the potatoes well, then tip them into the frying pan and stir well. Keep warm over a low heat, stirring occasionally. At this point, heat the vegetable oil in a separate frying pan and fry the eggs until done to you liking. Share the potato hash between 4 warmed serving plates and place a fried egg on top of each portion. Serve, sprinkled with freshly ground black pepper. Cook’s tips: Make sure you buy chorizo sausage that needs cooking – just check the packaging. If you prefer, poach the eggs instead of frying them.